This page last revised October 20, 2015. Snappy’s 13th Birthday Flash Sale! Receive a 50% discount on new web hosting orders and new WordPress cloud hosting orders. Snappy is officially a teenager! The beloved gator is growing up so quickly. In recognition of this big day, HostGator is offering 50% off all new hosting plans — including WordPress cloud hosting. Each and every international HostGator brand will be celebrating, and you’re invited to join in on the fun. 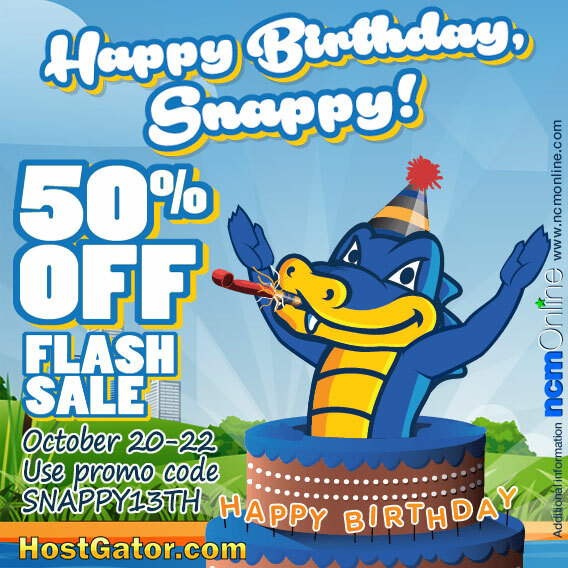 Help wish Snappy a very happy birthday, and launch your new website in celebration! Use coupon code SNAPPY13TH during checkout. Flash Sale: Tuesday, October 20th 12:00AM CST thru Thursday, October 22nd 11:59PM CST. Promotional price is in USD and is for the first term of service only and renews at the regular rate. Offer good from 10/20 through 10/22/2015. Please note that promotions will vary from region to region due to currency rates and different policies, but variety is the spice of any party. Current HostGator customers are welcome to join in and take advantage of this great offer; however, the offer is only applicable to newly created hosting packages. That means the discount does not apply to extensions, renewals or upgrades of existing hosting packages. Please note that your existing hosting package cannot be canceled and transferred to a new package in order to receive the discount. If this occurs, you will be billed retroactively for the discounted amount. All coupons and discounts are only valid towards the initial purchase and do not affect the renewal or recurring price. The discount offered for domain names only applies to newly purchased domain names. It cannot be applied to renewals or transfers.